June 26, 2006: Picture this: A cup of coffee, steaming and black. Add a dollop of milk and gently stir. Eddies of cream go swirling around the cup. Magnify that image a million times and you've got a Lunar Swirl. Lunar swirls are strange markings on the Moon that resemble the cream in your coffee—on a much larger scale. They seem to be curly-cues of pale moondust, twisting and turning across the lunar surface for dozens of miles. Each swirl is utterly flat and protected by a magnetic field. What are they? "We don't know," says Bob Lin of UC Berkeley, who has been studying the swirls for almost 40 years. "These things are very strange." One of the swirls, Reiner Gamma, can be seen through a backyard telescope. It lies near the western shores of Oceanus Procellarum (the Ocean of Storms) and looks at first sight like a strangely disorganized crater. Indeed, that's what most astronomers thought it was until 1966 when NASA's Lunar Orbiter II spacecraft flew overhead and photographed Reiner Gamma from point blank range. Whatever it was in that grainy black and white photo, it was not a crater. Before long, two more swirls were found on the Moon's farside. They lie directly opposite the nearside impact basins Mare Imbrium (the Sea of Rains) and Mare Orientale (the Eastern Sea). Impacts on one side of the Moon, it seemed, made swirls on the other side. No one could explain how. The mystery deepened in 1972 when Lin and colleagues discovered that the swirls were magnetized. "It was an accidental discovery," he recalls. As often happens in science, "we were trying to learn about something completely different." Their target was Earth's magnetic tail, a ropey pasta of magnetic force fields extending from Earth more than a million miles into deep space. The solar wind blowing against Earth's magnetic field makes the tail, and in the days of Apollo not much was known about it. To study the tail, "we built two small satellites and asked NASA to put them in orbit around the Moon." The Moon is a great place to sample the Earth's magnetotail, he explains, because the Moon passes through the tail once a month as it orbits Earth. NASA said yes, and two "sub-satellites" were deployed by the crews of Apollo 15 in 1971 and Apollo 16 in 1972. "The astronauts pushed a button and the satellites were shoved into space by a spring," says Lin. 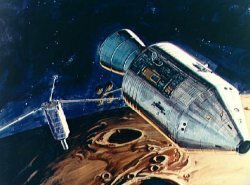 Free of the Service Module (the Apollo mothership), they orbited the Moon, gathering data collected by onboard electron detectors and magnetometers. As the sub-satellites flew just 60 miles above the lunar terrain, they passed in and out of strange magnetic domains. Magnetic force fields were sprouting out of the lunar surface, reaching up and affecting the satellites' sensors. "We realized that the crust of the Moon must be magnetized," he recalls. It wasn't a global magnetic field like Earth's, but rather a crazy-quilt of magnetic patches. 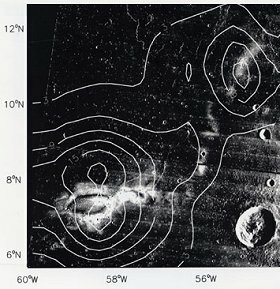 The strongest fields were located above Lunar Swirls. "The swirls have magnetic fields measuring a few hundred nano-Tesla (nT) at ground level," says Lin. (Earth's magnetic field, for comparison, is 30,000 nT.) "If you walked around a swirl with a magnetic compass, the needle would swing back and forth in a confusing way. You'd quickly get lost because the magnetic fields are so jumbled." "Almost four billion years ago, the Moon had a liquid iron core and a global magnetic field. Suppose an asteroid hit the Moon. The blast would make a cloud of electrically conducting gas ('plasma') that would sweep around the Moon, pushing the global magnetic field in front of it. Eventually, the cloud would converge at a point directly opposite the impact, concentrating the magnetic field at that point." Eons later, the Moon's core cooled and its global magnetic field faded away. Only the strongest, tangled patches remained--the swirls. This idea provides an explanation for the light, creamy appearance of swirls. According to some researchers, moondust is darkened by long exposure to solar wind. Maybe the swirls are light because they get less exposure: their magnetic fields deflect solar wind. If so, lunar swirls are merely a shadow of the magnetic forces arching above them. It all sounds neat and tidy, but there's a problem: While two of the lunar swirls are directly opposite an impact basin, one is not: Reiner Gamma. The prototype swirl doesn't fit! "It's a real mystery," acknowledges Lin. More clues are on the way. NASA is returning to the Moon, eventually with people but first with robot scouts. Leading the way is Lunar Reconnaissance Orbiter (LRO), due to launch in 2008. Among other things, LRO will make detailed 3D maps of the whole Moon using a state-of-the-art camera and a laser. Its view of the swirls should be breathtaking. Another NASA instrument, the Moon Mineralogy Mapper, is hitching a ride to the Moon onboard India's Chandrayaan-1 spacecraft, also due to launch in 2008. Using an infrared spectrometer, "M-cubed" will survey the lunar terrain and tell us in fantastic detail what minerals are in the ground. The whole Moon will be surveyed--including swirls. What are swirls made of? Are they truly flat? How does the cream differ from the coffee? Questions to ponder over your next cup of joe…. Lunar Prospector -- In the 1990s, magnetometers onboard this NASA spacecraft surveyed the Moon, confirming and expanding the results of the Apollo 15 and 16 subsatellites. 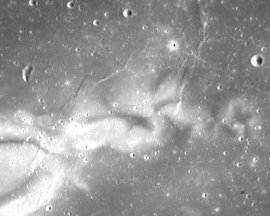 Optical Maturity and Magnetic Studies of Lunar Swirls -- by C.G. Hughes et al.